I was able to work on AM2R quite a lot these days. The most interesting addition to the already complex game was a cutscene system. Before, all the small puzzles had their results in real time. So, in order for the player to see the outcome of his/her action, the entire puzzle had to be constrained to a single screen (sometimes a little bigger). Now, when an important event is happening, it takes control of the camera and shows the event properly. Cutscenes done so far are very short right now, and can help make bigger puzzles (don´t worry, the level design doesn´t depend entirely on them). Many small tweaks and improvements were done in a lot of rooms. New level tools were done to provide Metroids proper ways to avoid cramped areas, helping them follow Samus more effectively. There were small places where you could hide and rethink your approach, but now Metroids give a fierce chase. The rest of the progress was mostly changing some naming conventions on game events, separating them in areas and unifying different types. There were different event lists (Metroid events, stage events, lava events, etc. ), now it´s only one. Even if it´s a way of reorganizing resources, it really helps speeding the delopment up. Like always, comments and suggestions are welcome. Looks awesome as always. Glad you are taking the time to perfect this game. Looking forward to trying it! Glad to see regular progress on this. Keep up the good work! God and Odin think highly of this! will you ever cease to amaze me? I LOVE THIS UPDATE!!! thanks doc, YOU NEVER DISAPPOINT!!!! awesome! :) keep up the good work! Please keep up the good work, true fans can't wait! Also, if you are having problems with the sound track, check out OverClocked Remix, they make good remixes of many games and I believe they would be happy to help you. HAppy to see This ! When this game does see the light of day eventually will their be a way to play it on a mac i do have parallels but when i play the demo on it it lags pretty badly my mac has no problem running an n64 emulator in a virtual windows 7 but for some reason confrontation lags and ive seen videos of it running smooth so i know it is a very good game. also i thought it would be cool to make a new gameplay video and make it look like its being played in an old gameboy of course it never will be but it would be a creative video. 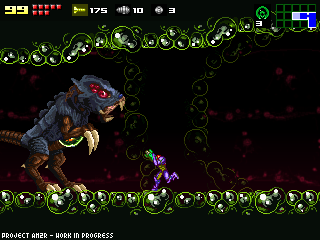 We already have many versions of Metroid confrontation and the game is already close to its completion. I don't think we need yet another demo; I've never seen such large demos for a single game. If anything, doc could make a trailer, but trailers of the game already exist. If doc gives us sneak peeks or trailers, I really hope he keeps them spoiler free. If I see a single picture or scene with the metroid queen, a hatchling, or a new mini-boss, I'll scream at the top of my lungs and I'll destroy my computer. Doc... Words cannot express the awesome that is your existence. is taking too long to be completed. already have several years on the same project. Gato, you are going to hell. Gato, the reason for there being so many years on this is because Doc has his own life to live. He has other things to do than to keep working on this game. Plus, the more time Doc puts into this project is only going to make this game that much better when it's finished. Not trying to make anyone mad, just pointing out that Doc has other things to keep up with other than AM2R. What did this update have to do with testicles, though? @gato, i'd like to see you make a game this epic in less than 5 YEARS. you have no idea of the time and patience it takes to make something even as small as confrontation. SO GTFO AND STFU. No no i didn't want a new demo i just wondered if it was going to be mac accessible when it comes out or eventually be accessible over time i did get to play the demo at a friends house hes got a pc and it ran great i dont get it on my mac i can play banjo kazooie with a ps3 controller as best as the emulator can take on a virtual windows 7 but that game runs choppy ill fiddle with it more see if i can improve it i have the most recent version of parallels. By the way, you think there will be a demo any time...ever? Honestly, this game is taking a really, reaally long time to be done. Axl, games take a VERY long time to make, especially when you're doing them solo. Since he's recreating Metroid 2, he has a colossal workload. And I use Game Maker like he does, and I know its a somewhat slow process to create something. Doc isn't doing it solo.... Check out the credits for Confrontation. WOOT AWESOME CHEERING YOU ON!!! me estaba preguntando, si en algun momento (despues del lanzamiento oficial) podrias revelar a la luz publica el motor de creacion del juego para que cualquier persona (digo gente paciente y dedicada )pudiese hacer sus propias versiones de am2r o hacer juegos completamente nuevos, como historias de universos alternos, nuevos personajes etc., solo quisisese saber si se podria crear mas juegos como los que tu haces, puede que lo que hagas se genial y hermoso para todos los retro gamers, pero no seria mejor si mas de uno pudiese gozar y compartir nuestras ideas en base a tu proyecto? saludos desde chile!! AGUANTE AM2R!!!!!!! This is amazing! I wonder how cool will be the cutscenes at Samus' arrival to SR388, the last egg, the Queen, the baby hatching and Samus leaving the planet with the baby. Like I did months ago, I still suggest you to put a cutscene of the Parasite X appearing after Samus leaves the planet. With the metroids extinct, there's no more threat for the parasites to start infecting other creatures. Then a yellow goo jumps on a frog and the frog gets weird, as a dark music is played, then the screen gets black and there's only silence for a few seconds, before the credits appear. I don't know, I think that detail would just make the end cooler and conect it to Metroid 4 Fusion. With or without this scene, I know this remake will not disappoint us. Zero Mission did, a lot. But this won't. I actually liked Zero Mission a lot. @God Well, I know he's not doing EVERYTHING alone, he does have a spriter, but as far as I know, with tiling, placing everything in the game, etc, he is doing that alone. Besides, can't download Confrontation anymore. Lolwut? You can still download Confrontation. me too. Zero mission is one of my favorite metroid games. the ending felt a bit "forced into the game" story-wise, but it was still some cool stealth gameplay. the Norfair theme remix in my oppinion was pretty crappy (it was my favourite theme from the original, they could have done it better!). but overall I thought the game was really good. My favorite Metroid game would probably be Super Metroid. I love the soundtrack from SM. Least favorite would probably be Other M. Don't get me wrong, I like Other M, but its not the best quality as the others. Bruno's idea of adding a cutscene of the Parasite X thriving is excellent. Please do that! @God Hmm. Odd. Earlier when I checked it said the file was missing on two of the download links and one was locked or something of that nature...? Not sure what's up with that, seems to be working fine now. Darn thing trying to make a monkey out of me. Did anyone really feel that Metroid 2 lacked cutscenes? I don't see how they might help, only the contrary. Wonderful! The only thing The only things who is bothering me is the music songs... confrontation is good , but the song in repetitive, that can ruin the experince of the game! Well... keep the good work and thanks Doctor64! I think Samus should moan when she jumps or gets hit. The jumps could have feet sounds and a female effort voice. And getting hit, instead of making a weird sound, she should scream, like in Metroid Prime. You could take these sounds from Prime series. I also think, if there be a girl with beautiful voice, you should call her to narrate parts of the game. Not the whole game like Other M, just a few parts, like the begin, her surprise to find chozo ruins, etc. Zero Mission is fun to play, I can't deny. But AS A REMAKE, it could have been a lot better. If we compare Metroid 1 to Zero Mission, by the time each one was made, Metroid 1 is better. Besides, Metroid 1's plot is simple. Zero Mission is based on that childish and too fantasied manga, and that extension after Mother Brain just sucked. I can't wait for Skyrim too! I've been following this project for longer than I can remember, but all I have to say is I commend you and your team for every ounce of effort. You are truly passionate about this and it shows. I think I'm not alone when I say that I think this revamped installment into the already great series of such an excellent game will make it that much more phenomenal and that it will really give the old school fans their original spark of fascination in the game back with incredible flair. I have no favorite Metroid to date, but original RoS was the first I ever played, being 24 now, and I love every Metroid thus far, but this will be a highly potential favorite. Your diligence is appreciated the world over, Doc, and I think new players to the series will be surprised and overjoyed to discover this gem some day. If the is released will it be free? Of course it will be free, it is a fan game first of all, and it would be illegal if charged money for it. Man i'd love to be beta tester!!!! Hacia mucho tiempo que no posteaba en tu blog Doc, desde que comentabas que tenias problemas de salud o con tu entorno. Llevo siguiendote desde hace muchísimo tiempo y me alegra mucho el tiempo que le dedicas a este proyecto tan impresionante. Se me olvidaba decir que ánimo con el proyecto, lo estás llevando muy bien, eso sí, sin dejar a un lado otras responsabilidades. Anyway, this project is looking great! It's nice to see that some of the little "tricks" for beating the metroids won't work in AM2R. Nice job! See? What did I tell you about Ocarina of Time 3d? Pure awesome! Great update Doc! Looking forward to this! Nice update Doc! Good to hear progress is still in the mix. A big hell ya for Oot! None of which files are able to be downloaded, DNA Hacker? Confrontation? Well, I believe my suggestions can still be accepted, even the game being almost done. Adding voices from Prime series when Samus jumps or gets hit doesn't interfere in the rest, I believe. The X Parasite cutscene, after the credits, wouldn't intefere too, I guess. Well, maybe narrating the game like in Other M was an exagerated suggestion. Just letters like in Metroid 4 Fusion would be enough in some parts of the game. Samus could talk to herself in some cutscenes, like when she finds chozo ruins and the still working robots, she says "I had no idea the ancient chozo had been in this planet before". Phrases like that would make the game make more sense. I'm sure this is gonna rock. I still suggest that you put, as secrets, ALL suits Samus got in ALL other games. I don't think there will be elevators. podrias hacer el juego en formato ps3 o gba ya q tengo un emulador para la ps3? Well, I hope we get live update announcements after the initial release. (I would like to see some alternate suit modes for later versions, like the Justin Bailey or the classic 8-bit sprites.) Great to see you found some time to continue working on the project. And to those who think this project may be taking quite a while... I have been holding my patience for two years, and believe me, at least one of you may have been waiting for another game FAR longer than two or three years. Well, I think it's about time to show us a demo. I'm dying to play this game, a demo would make me relax for a while until the full game is ready. SEGA screwed the guys from Bombergames, the group that made the unoficcial (but awesome!) Streets of Rage Remake. SEGA doesn't want to make a Streets of Rage 4 at all, but wants to sell that crappy version for cellphone... I think that's why SEGA attacked Bombergames and they're probably not making a new version of Streets of Rage Remake anymore. Then be careful, DoctorM64. You're getting famous and Nintendo probably doesn't like that. Make sure this game will be released and we'll do the rest, we'll put the downloads in as many websites as possible. Just like the Streets of Rage fans did for the remake, although SEGA tried to stop them. May i Ask, as it seems it did not work with my Xbox controller. Do you think it works with an Old Sidewinder from Logitech, i really want to play this on a Gamepad, which works fine ? Any suggestions ? The update that was posted not too long ago showed Doc's progress and showed that he was very near completion of the project. Yet working on cutscenes seems like he still has quite a long time left to complete it. I don't think by cut scenes, he means like animated 3d cut scenes or anything, just that when something important happens, the camera will zoom over to it... like maybe it will fade into another room and show the acid/lava lowering or something like that. It shouldn't be too hard as these were already scripted to happen, just now the camera will show us it happening. It must be really annoying for DoctorM64 to hear all these warnings all the time. You should add little bits and pieces to the defeated enemies, instead of just having them turn into a little fire ball. Nothing too gory or excessive, just a few particles.Remember crashing through enemies with the speed booster on super metroid? That's sort of what I'm thinking. I realize I am late to see this post, but I must give my opinion: I think that cutscenes are a mistake. I think that cutscenes are always a mistake. They destroy the continuity of the player's experience and the sense of being in control of the action, and the kind of cutscenes frequently featured in Zelda and Metroid Prime games that fly the camera over to some door opening or similar are usually pandering and unnecessary. Puzzles and dramatic situations should be adequately clued as to what their result will be both to make the player's motivation clear in approaching the task and to make the result apparent. Events for which cutscenes exist feel more like preordained bullet-points in the script of the game. They become separated from the phenomenology of the player's actions and exist as discrete platonic chunks. When the player triggers a cutscene, s/he thinks "Ah, this is the next step in my progress through the game. This was set up for me; there was no other course of action I could have taken." Even though that may be true in any linear game design, a cutscene grossly draws attention to the fact. It's best for events to occur in the world while the player retains control because it allows the game world to feel like a living place. Consider the dramatic events of Super Metroid and the fact that its storytelling techniques completely eschew cutscenes. You can also look to Half-Life 2 for some ideas about how to direct the player's attention naturally. I remember an early developer commentary node in Half-Life 2: Episode 1 that explains how a situation was carefully constructed to pull the player's notice up to an unusual angle to witness a damaged ship flying by inside the Citadel. You could use similar tricks to path the player's vision, sort of like visual breadcrumbs. Guide the player's attention rather than pulling the camera away. I also suggest allowing small environmental changes to occur slowly over time, without directing the player's attention to them. An example might be creatures that gradually tunnel through dirt or that molt and leave husks behind (which can also serve as a warning for a forthcoming danger). 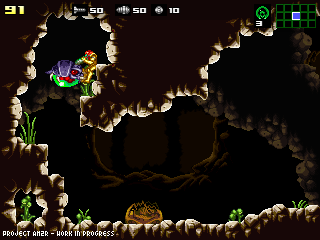 Metroid 2 already features earthquakes and magma floods; adding dynamic geological and ecological elements extraneous to gameplay can make those important progress gates feel more natural in context. But at the very least, please consider finding ways to use graphics and sound to communicate to the player what effect on an off-screen object solving some puzzle might have so as to avoid the Zelda-style fly-by cutscene. Internisus: Your thoughts on the matter is excellent! I hope this feedback will get some conciderance. Personally, I think that the less obvious and waypointing a metroid game is, the better it is. Minimalism in the storytelling and understated events makes upp much of the organic, yet isolated you're alone and in charge-feeling. And to Doc and collaborators; keep up the good work. This is what i've been waiting for for a few years and there's a huge fan base who are doing the same, wether they're aware of this project or not.